Do you have a naked front door? My front door has been wreathless since the holidays. Wreaths add so much charm and curb appeal to a home. A door with a wreath always says welcome, don't you think? 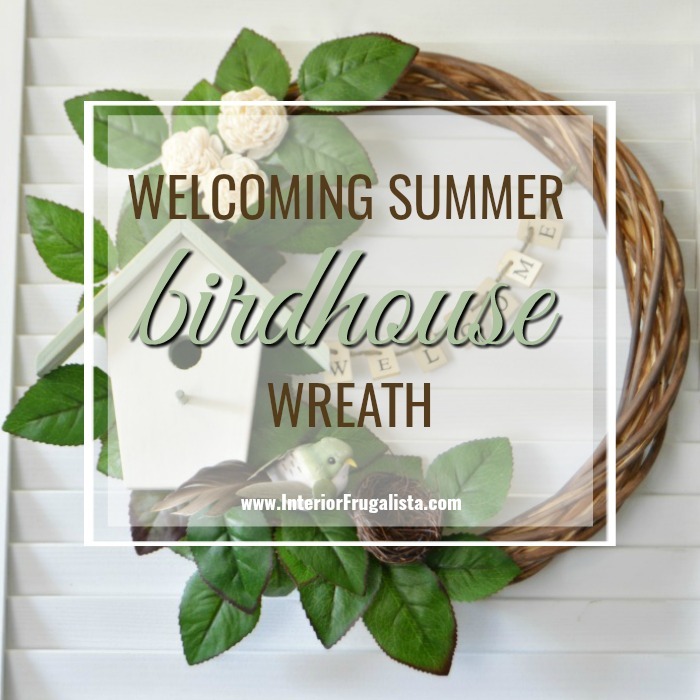 Making my welcoming summer birdhouse wreath was long overdue. The goal for my DIY wreath was that it had to be inexpensive, preferably using items I already had on hand and super easy to make in a jiffy. Most of the items to make mine were purchased at the dollar store or Goodwill - can't get much cheaper than that! 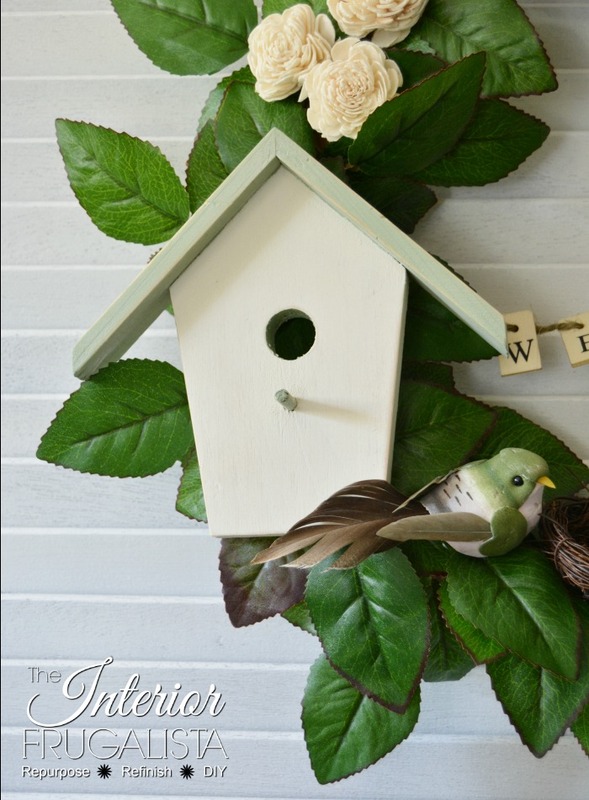 It all started with this wooden birdhouse door hanger from Goodwill. I contemplated leaving it intact and painting the houses in bright whimsical colors. I also thought about decoupaging each birdhouse with different floral napkins. 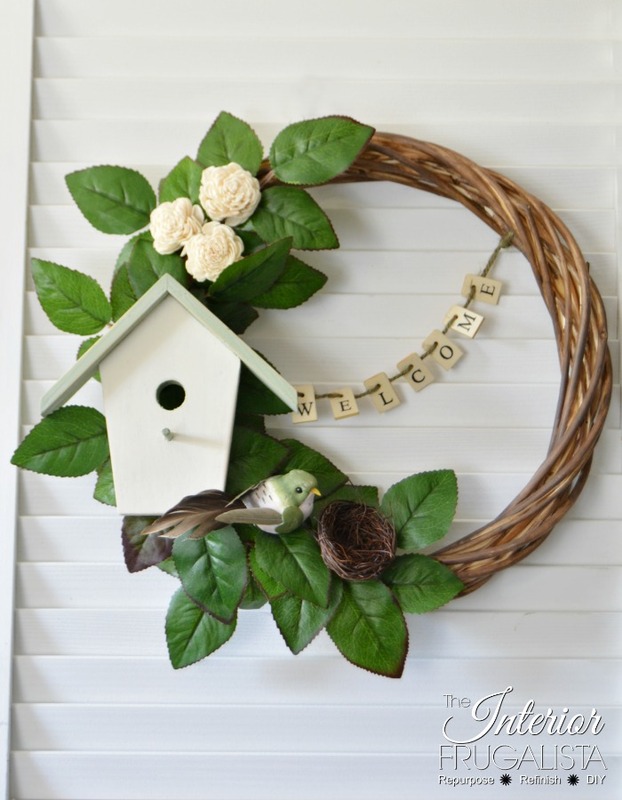 But my mind kept going towards separating the birdhouses and creating two fun projects; one for our deck and this front door wreath for summer. I used the other two birdhouses to make a sign for our deck. 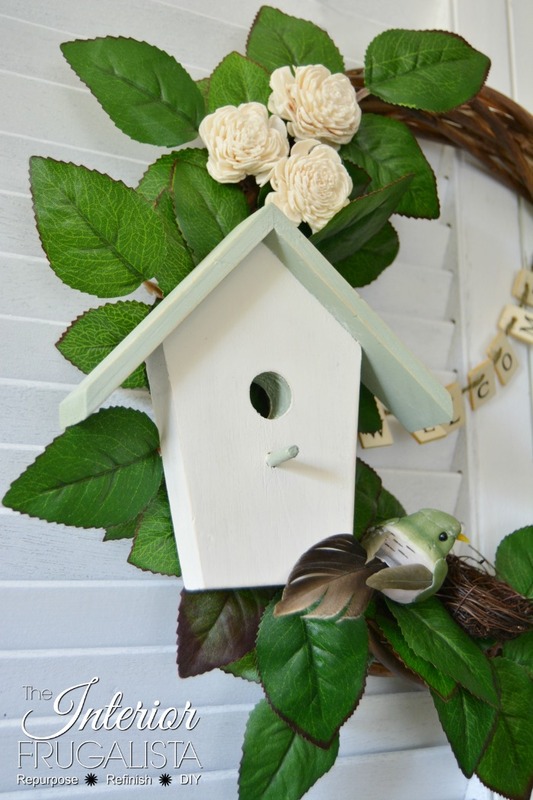 You can find it here in my DIY Wooden Birdhouse Sign For Lovebirds. These are some of the supplies I used to make the wreath. I've included a Materials List towards the bottom of this post. It contains affiliate links for your convenience so you can see what products I used or recommend to make this project. See my full disclosure policy. I found the willow wreath form at Dollar Tree but wasn't fond of the light color. 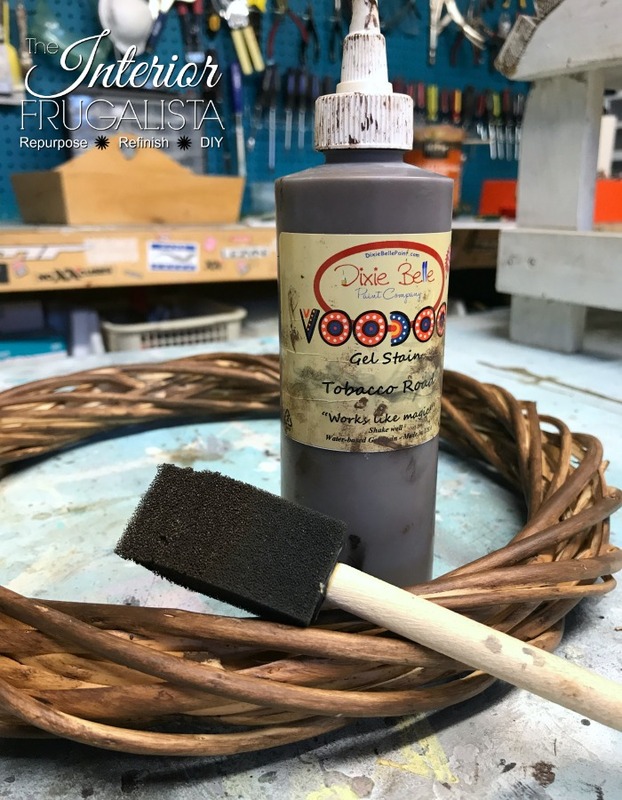 Using a foam brush and Tobacco Road Voodoo Gel Stain from Dixie Belle Paint Company, I darkened the wreath. I've had this stash of assorted faux leaves forever. I bet some of them go back at least 30 years. 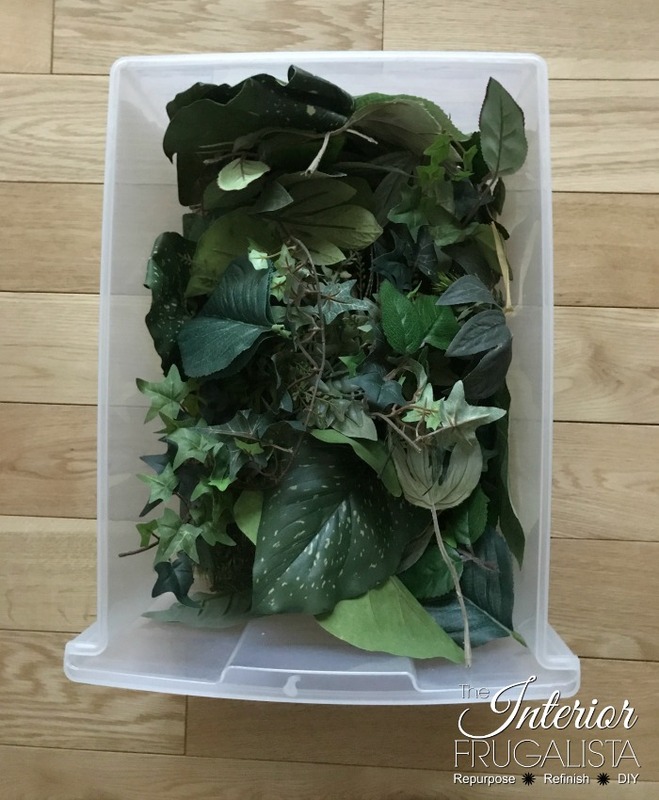 When going through the tub I found several leaves that were removed from the stems of silk roses used for our daughter's Rustic Wedding Centerpiece Boxes. I attached the leaves with florist wire and overlapped each one until I filled half of the wreath. 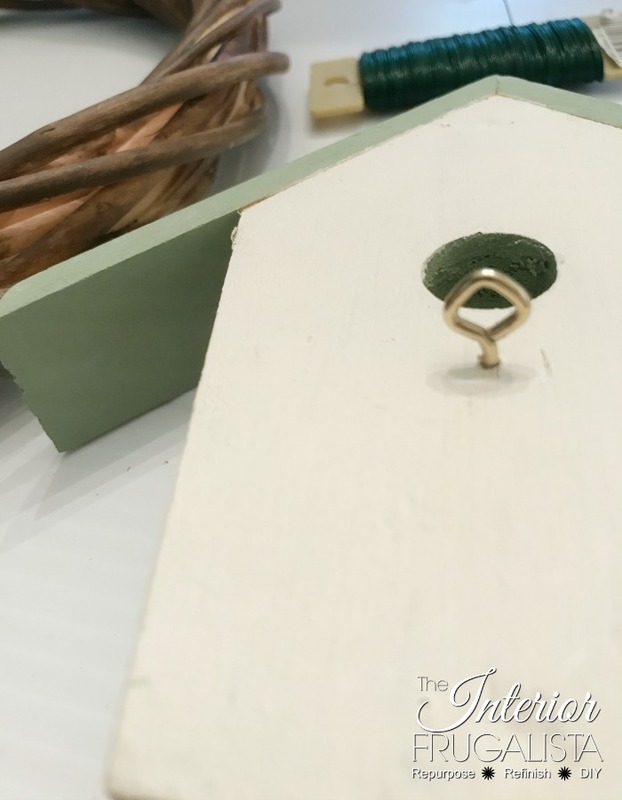 I chalk painted one of the birdhouses from the birdhouse door hanger old white and sage green. To make attaching it to the wreath easy I screwed two small eye hooks onto the back of the birdhouse and thread florist wire through the loop and onto the wreath. Another option would be to staple the center of a long piece of florist wire onto the back of the birdhouse. The adorable feathered bird came in a package of six from Dollarama and was hot glued onto the wreath. 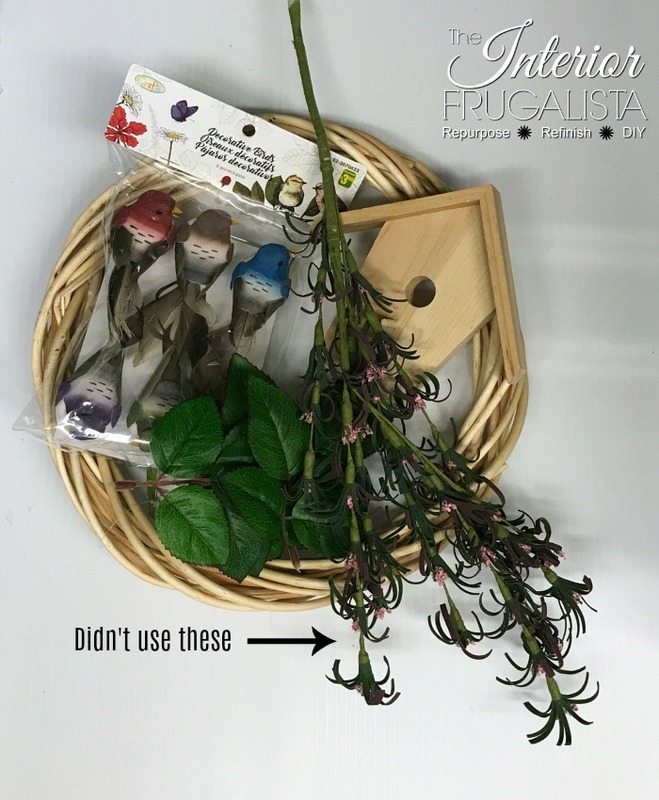 The mini grapevine birds nest was removed from the stem of an Easter egg pick also purchased at Dollarama. The mini roses came from a package of potpourri I've had for many years and hot glued onto the wreath. The wooden letter tiles were leftover from a banner I made for the DIY Rustic Wedding Card Caddy at our daughter's wedding. I believe I purchased them at Michaels. 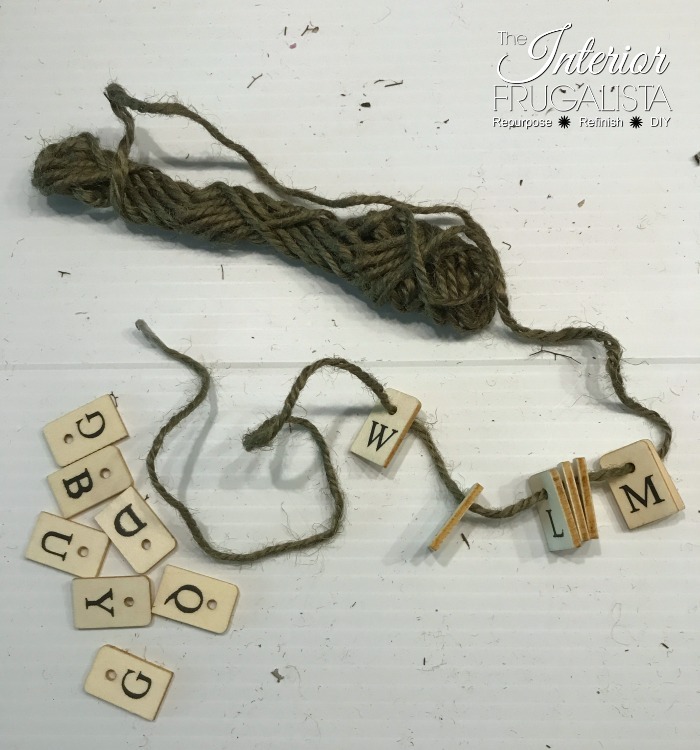 I simply strung the letters W E L C O M E through a strand of green jute twine and tied the ends onto the wreath form. I love the added touch of a banner hanging inside a wreath like I did here in my Easy Peasy Fall Wreath. I much prefer DIYing seasonal wreaths because they are so much fun to make and much easier on the pocketbook. I have such an affection for birdhouses. They take me back to my childhood where my paternal grandfather built a birdhouse village in the trees in their backyard. So no surprise that I decorate my home with them. With candlesticks from the dollar store, I made Pedestal Painted Birdhouses for a Spring vignette in the master bedroom. I also made Dollar Store Birdhouses Decoupaged With Napkins. Items on the list that do not include a link can be found at the Interior Frugalista SHOP on Amazon. 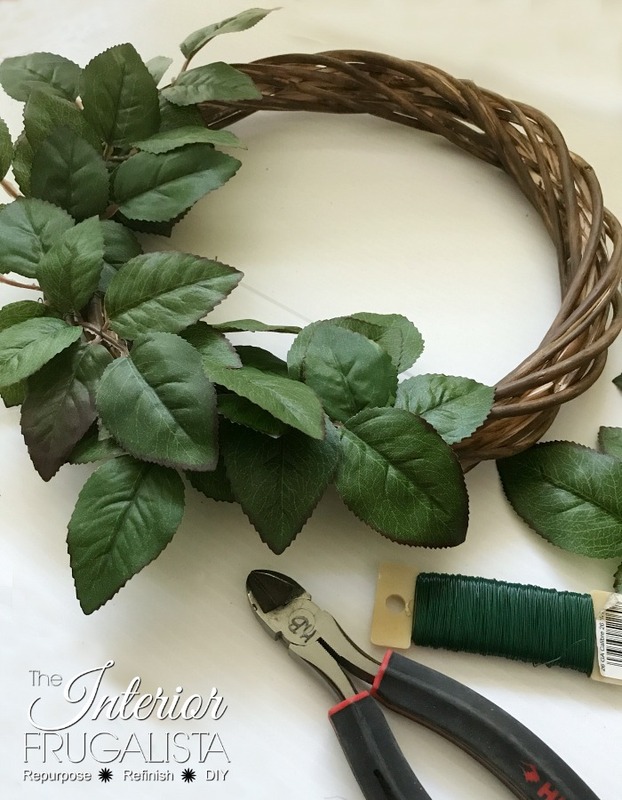 Have I inspired you to take a trip to the dollar store for supplies to make an inexpensive natural rustic wreath for your front door this summer? Perhaps you don't have the time or desire to make your own. 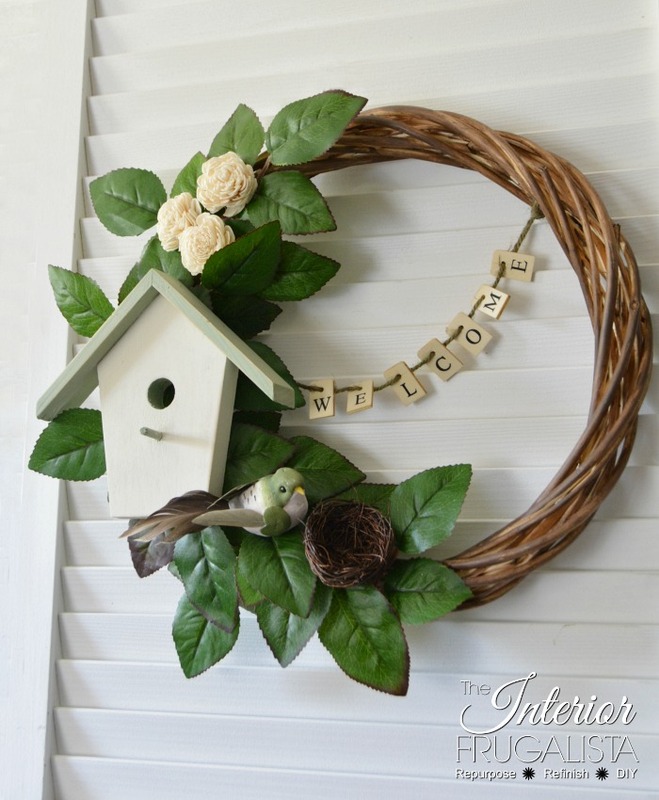 Here are a couple of summer birdhouse wreaths I found that you may like. I love this, Marie! I really like the banner hanging inside the wreath, too. Cool effect. Pinning! Such a cute wreath! 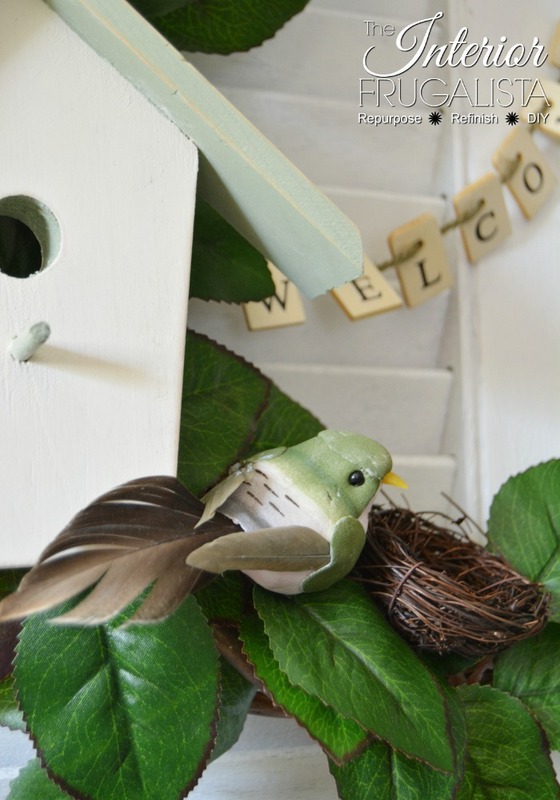 I love the birdhouse and bird nest! Lovely! Pinning! Thank you so much, T'onna! Appreciate the visit and the pin 😃I was happy to put the wooden birdhouse hanger to good use. SOOOO cute (and pretty!) 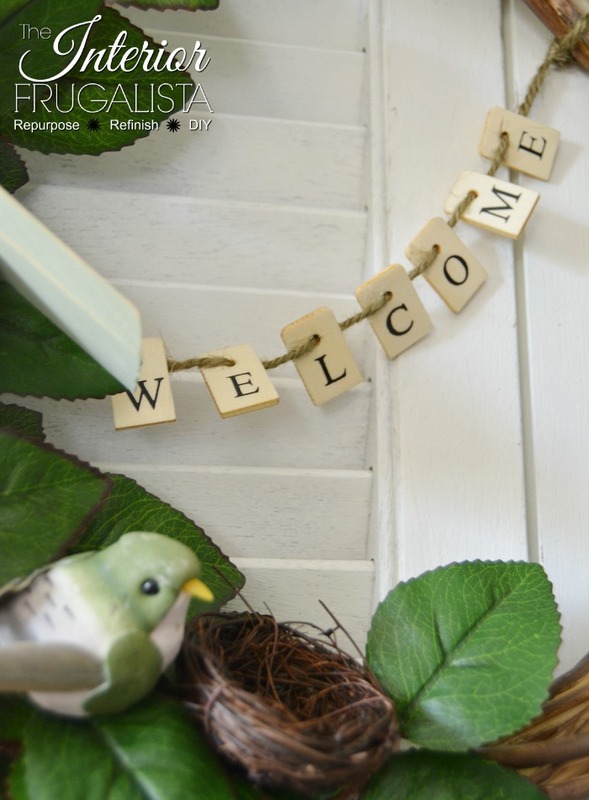 Love the birdhouse and the letters you used! 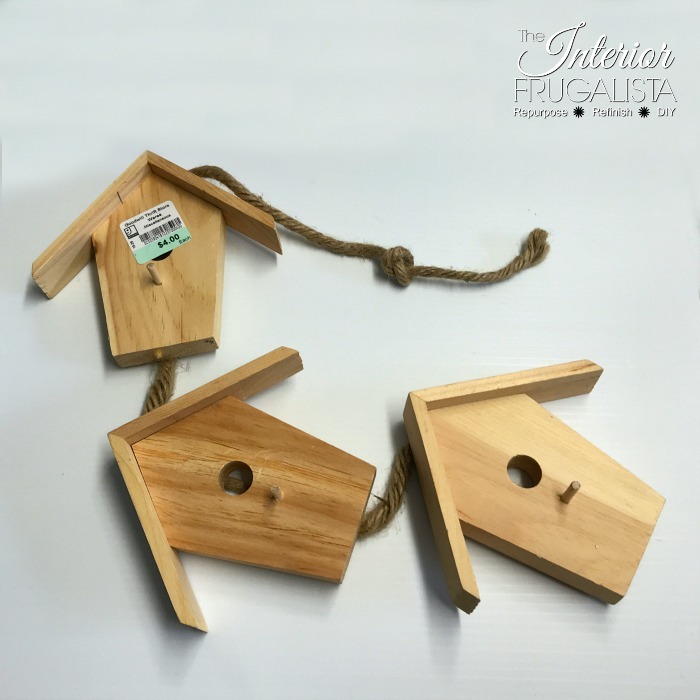 So fun that you still have two birdhouses for more projects! Thank you so much Julie! I was happy to put the wooden birdhouse hanger to good use. I made a Lovebird Birdhouse Sign for our deck with the other two. I love this wreath, Marie. I'm making it. I have a larger willow wreath and bought a birdhouse for $1.50 at Michael's. I have a stash of rose leaves, too, from previous projects. Love the welcome sign. I have some Scrabble tiles which I might use for that. You are quite the genius! 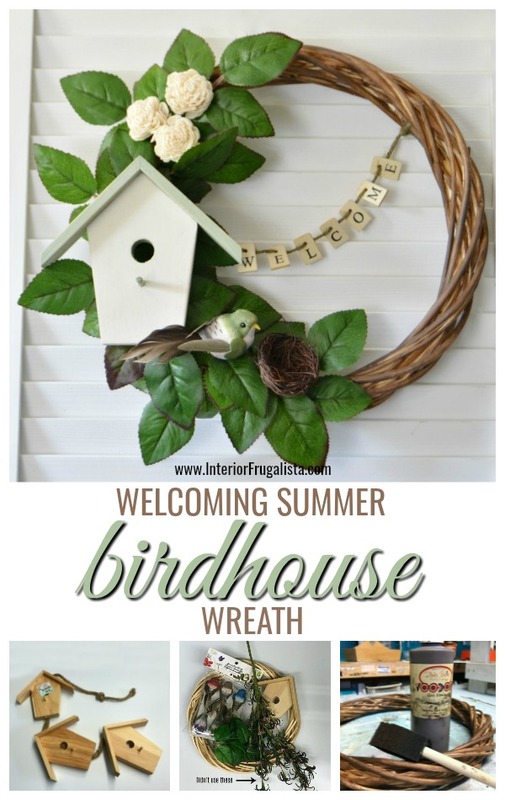 Yay, so glad you have everything you need to make your own version of the birdhouse wreath. Have fun making yours, Barb and I'd love to see it when your done!